The theme for this month is ‘I’m tired!’. I started the triathlon training for my upcoming half ironman event on May 1st. It is a 10 week training plan to get me ready for the Rev3 Williamsburg race in July. I’m actually doing both the Sprint triathlon on the Saturday and the Half Iron distance on the Sunday. Sleep is something I’ll catch up on after the New Jersey State Triathlon at the end of July. ‘Tri Season’!!! My total mileage for the month was 438 miles which was comprised of 16 miles swimming (all in the pool), 337 miles on the bike (unfortunately 293 were indoors on the bike trainer) and 85 miles running (51 on the treadmill). I have no idea how people train for a Full Ironman. They must never sleep. Or perhaps they drink a lot of energy drinks? So most of the month was taken up with training. Up early to get a workout in before work and then up late to get a workout in when the boys were in bed. Towards the end of the month I just got up extra early to get both workouts in before work. It gets harder as the week goes on for sure. You cannot fake training for this distance. You cannot wing a 1.2 mile swim. I’m pleased that I’m sticking with the plan and I’m sure that finishing the race will feel like an amazing reward after all of this. I took part in a new race for me this month. The Bucks County 10 Miler. This was my first 10 mile race for a long time. I’ve not been able to run the Broad Street Run for a few years as I’ve either run the New Jersey Marathon or the Pittsburgh Marathon on that date or the week prior. This year my wife ran Broad Street so I got my turn a couple of weeks later in New Hope, PA. The race was started and finished in New Hope, PA so a Star Wars theme was part of the event. Great. I’m a big fan. It was run mostly along the Delaware Canal and the conditions on the day were perfect. Not too hot and sunny. I myself wore a Star Wars themed shirt but I saw commitment from people running in full costume. Kudos to those runners. As much fun as the them was, I was still there to race. My official time was 1:22:25, which is a full 3 minutes faster than my last 10 mile race a few years ago. It’s not a distance I regularly race. Thank you for reading. See you next month. December is over and another year has been completed. 2016 was a year of accomplishments that I never thought possible and was very rewarding. Looking briefly at my December stats I completed 143 miles. I also managed to finally get back on the bike (albeit indoors on the trainer) and managed to make it into the pool a couple of times. It’s back to work over the winter. Hopefully this will pay off in the summer, however there is still the March marathon that my wife and I are training for. It’s going to be a long winter of training but all for a good reason. You will notice from the Garmin data below that I have the ‘scale’ symbol from December 1st. I bought the Garmin Index Smart Scale on Black Friday…I’m already regretting that one!!! I’m hoping that this winter training pays off before I have to squeeze into that triathlon spandex in the springtime. Overall it was a lot of fun. Lots of good work with some good results, so lets recap 2016. With no runDisney races for the first time in recent years the winter months were spent training for the spring marathon and avoiding the cold and the snow. With the treadmill we bought at the end of 2015 I was lucky not to miss too many days of training. I even became a regular at the pool towards the end of February. My wife and I did run the Eanie-Meanie-Minie-Moe Half Marathon with our local running club (Bucks County Road Runners) as part of their Winter Series. Lots of fun…lots of hills…but on the plus side, lots of food at the finish. My wife and I also took part in the Philadelphia Phillies Charities 5K. This was my first time running this event although my wife has run it every year. It was a lot of fun. I don’t run too many 5Ks and this was over too quick. Still we had a fun time down at the stadium. 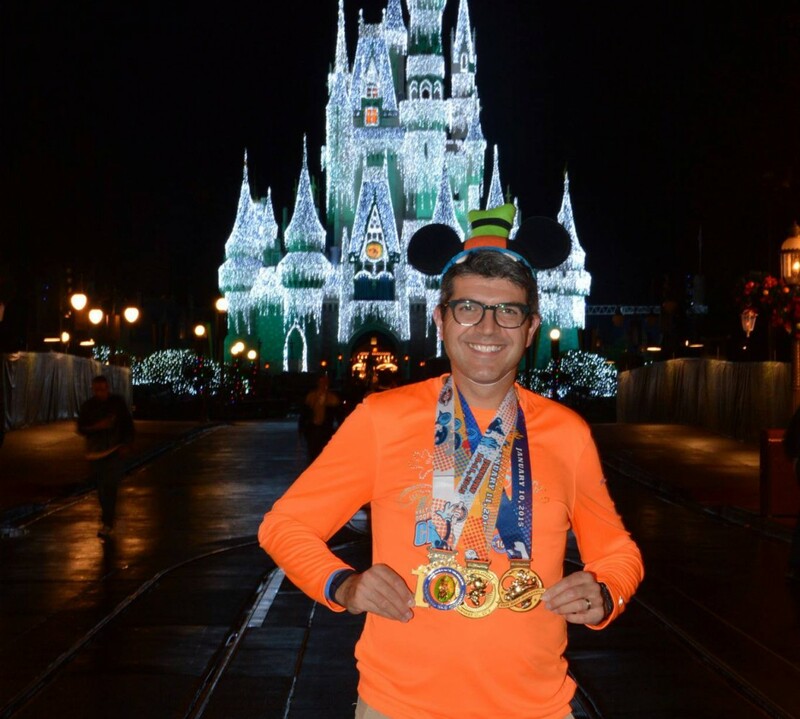 At the end of March I was invited onto the Let’s Run Disney podcast to talk about my ‘Goofy In A Day‘ experience back in 2015 where I ran 39.3 miles in one day to raise money for ‘Give Kids The World Village’. At the last-minute I decided to register for and run in the Rutgers Half Marathon in New Brunswick, NJ. I had run this race in 2015 and enjoyed it. It was a good warm up to race season. I wasn’t expecting too much and managed to end up running a new half marathon PR. A good days work and definitely a confidence builder going into the season. I was invited after this race to join my friend John on his ‘Runner of a Certain Age’ podcast for a race recap. On my way to a new Half Marathon PR at the Rutgers UNITE Half Marathon. At the beginning of May was the New Jersey Marathon. I had run this back in 2013 and 2014 and this is still my current marathon PR. This time I was running with my wife and we met up with my friend Elvin who ran with us for the first 19 miles. It rained from the minute we started the race until the end. It was a truly soaking run but we had fun and we made the best of it. A few days after the marathon, I got up early one morning and while getting my biking cleats on I managed to strain my sacroiliac joint. Ouch. Big ouch. I was laid out flat for two days unable to sit up. After three trips to the chiropractor in two days and lots of time laying on a heat pad I was finally up and moving again. After 9 days off (yeah…I know not a lot) I was running again. My wife was the race director for her company’s 5K (which was more like a 5.5K) and we all (me, both boys and my father in law) were taking part. I didn’t want to show myself up so I put the hammer down and ended up 3rd in my age group and 10th overall. The boys had a great time running the 1 mile fun run. My wife (and her company) did an awesome job. Following the New Jersey Marathon I was in full triathlon training mode. I was training for my first Half Iron distance in July. My training went from a max of 7 hours a week (when training for a marathon) to between 12-16 hours a week at the peak of triathlon training. During the peak of my triathlon training I had to take a business trip to London. I was unable to bike and swim during the 10 days overseas but I did get the opportunity to enjoy the great English summer and I got a lot of running time (and sightseeing through London) in the early hours of each day. My hotel was in Central London and I was able to cover lots of ground on foot. It was great. I was also fortunate to spend time with my Sister and her family and with my Parents. It was a great trip and a productive work trip. Finishing my time in London with a final run over Tower Bridge. Maybe one day I will be able to get back for the London Marathon. This was the big month. This was what I had been training for all winter long. My first Half Iron distance triathlon. I participated in the HITS Hudson Valley Triathlon up in Kingston, NY. It was my first attempt at a 70.3 mile swim, bike, run event. I had a great experience made all the better with meeting up with my friend Bob (also doing the Half Iron distance) and having my wife’s Aunt and her family meet me at the finish line. I was on a high for days after the event despite my exhaustion. It was great. Later in the month and with temperatures in the 90’s I took part in the New Jersey State Traithlon at the Olympic distance. This was the site of my first triathlon attempt which was washed out by a lightning storm in 2015 with only the swim and bike legs completed. This year I was able to complete the race despite the intense heat and had a lot of fun. I’m already signed up for this event again in 2017. At the end of July I was invited onto the Team Shenanigans podcast to talk about transitioning from marathon running to triathlon training and racing. That was a lot of fun (and thankfully heavily edited). With my focus back on marathon training I set about the summer months getting my long runs in for my October marathon. While I may have sounded like winter training is hard (it is) the summer training for a marathon really beats you up. It is the heat and the humidity that really stresses the body. It is easier to run in the cold with layers to keep you warm but its hard to run in the heat as you are already minimally dressed and it is hard to cool down. We took our vacation with the boys this year in Myrtle Beach, SC and the heat and humidity were intense. I stopped on my long runs to refill my water pack which is something I never need to do at home. While on vacation both boys ran a 5K with us to earn their own virtual runDisney medals. We were very proud of them and they want to do this again in 2017. At the start of the month I was invited back (as a last minute stand in) to my friend John’s ‘Runner of a Certain Age’ podcast to talk about the Rock ‘n’ Roll Race Series. This was the peak of marathon training for me with the upcoming marathon at the beginning of October. Thankfully the weather was still great for most of the month. Cooler but not too cool. I had two races this month, the Hightstown Triathlon (my last triathlon of the season) and the Rock ‘n’ Roll Philadelphia Half Marathon (my 6th consecutive time running this race). The triathlon was lots of fun. I was confident going into this as this was the shortest of my races this year and it was great to be joined by a couple of my work colleagues. I ran the Half Marathon with my wife. It was a tough race as it was only 48 hours after my last 20 mile training run but we powered through and made a respectable time. The first week of October was the Mohawk Hudson River Marathon. This was to be my goal PR race that I had trained for. Despite the scenery (the Adirondacks in the fall is breathtakingly beautiful) my time goal was not meant to be. I faded during the last 7 miles of the race and ended up running just over 4 hours. Not what I had planned but still respectable. I wasn’t disappointed. I did the best I could on the day but it just wasn’t my day. Still, we had a great weekend meeting up with family in Albany and my wife ran a great half marathon. This was a busy but fun month. It started out with me ‘race chasing’ my wife as she ran (and earned a new PR) in the TCS New York City Marathon. She had won her place in the lottery and I did all I could to support her over the weekend. It was a great time and I was so proud of her. I had a lot of fun running and taking the subway all across the city. I managed to see my wife four times during the race and the weather was perfect. The week before Thanksgiving is the time for the Philadelphia Marathon. This year I was running in the inaugural ‘Rocky Challenge’ which involved me running the Philadelphia Half Marathon on the Saturday and the Philadelphia Marathon on the Sunday for a total of 39.3 miles. It was lots of fun. I wasn’t putting too much pressure on myself other than to just finish each race. I was totally thrilled to run each race under my target times and for the weekend I ran a sub 2 hour half marathon and a sub 4 hour full marathon. This was despite a significant change in the weather between the two days. I was really pleased with my performance and this capped off my racing year on a high. We finished the year with our usual Thanksgiving Day 5 mile Turkey Trot which our local running club puts on. My wife and I ran together with a fairly decent time (I think near one of our fastest times). 2016 was a fun and rewarding year. I completed 3 marathons and 4 half marathons. I completed 3 triathlons, a Half Iron distance, Olympic distance and Sprint distance. I earned a new half marathon PR. I ran in London (and Atlanta and Arizona) and also participated in 4 podcasts. What fun!!! I cannot wait to see what 2017 brings. I’m hoping to get through the New York City Marathon lottery this year (my 3rd attempt) and I’ll probably run the Philadelphia Full Marathon again in November. Another late ‘Month in review’ post but technically getting in under the wire. November was a busy month with 150 miles in training and racing. Not my biggest month for distance but one of the busiest for activities. With all the running, I did still return to the pool for the first time at the end of the month for my first swim since September. I’ve been focusing on my marathon training since my last triathlon so it felt good to finally get back in the water. The month started off with the New York City Marathon. While I was not running myself (hoping to eventually make that lottery) I was there to cheer on my wife as she ran earning a new PR that day. It was my first time ‘race chasing’ and spectating a marathon and it was truly a thrill. The excitement for waiting for and watching my wife run her race and to cheer on friends and complete strangers was such a great experience. I cannot wait to experience this race for myself one day. The weekend before Thanksgiving is the Philadelphia Marathon. This year was the inaugural ‘Rocky Challenge’. While I have mixed feelings about how the weekend was organized I was proud of my performance in running both races, the Half Marathon and the Full Marathon back to back, in under 2 hours and 4 hours respectively. They were two of my best performances at those distances this year. On Thanksgiving Day itself is the annual Bucks County Road Runners Thanksgiving 5 Miler. This was my first race way back in 2010 when I started running. My wife and I ran together the whole race and this was our second fastest time we have run the race. It was a nice start to a long weekend of family time and was a great way to finish the month. November marked the end of my race season but after a week of recovery I jumped straight into week 4 of my marathon training plan for the 2017 Rock ‘n’ Roll DC Marathon next March. Oh well, at least I finished the race season upright and healthy so that is something that I really want to give thanks for.